trade as Brexit approaches, speakers at the launch of a new report recommended last week. 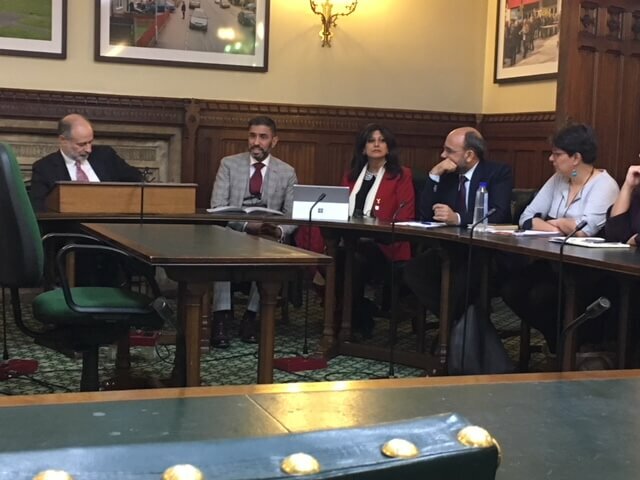 The Northern Powerhouse and India was launched by the Federation of Asian Business (FAB), last Wednesday (21) at the House of Commons. Shadow minister for peace and disarmament, Fabian Hamilton, the Labour MP from Leeds North East, hosted senior politicians at the event. Andrew Ayre, the head of British deputy high commission for Chandigarh; Professor Ammar Mirza CBE, president of FAB and Manish Singh from the Indian High Commission; Labour MP Virendra Sharma (Ealing Southall) and Guy Opperman (Hexham) were among those who attended. The report intends to build on the economic relationship with the Northern Powerhouse and the subcontinent, encouraging business partnerships and investment. The Northern Powerhouse was a proposal initially launched nearly four years ago, designed to boost economic growth in the north of England. India’s high commissioner to the UK, YK Sinha, did not attend, but a statement from him said the country’s economy has grown by eight per cent sustainably for a “reasonable period of years”, providing opportunities for business and trade. connections to other nations can make investments easier. the on-going platform of Northern Powerhouse and its engagement with India. He also acknowledged the three other key organisations that help make up the Northern Powerhouse, including the Asian Business Connexions, Yorkshire Asian Business Association (YABA) and the North West Asian Business Association (NWABA). Ayre followed on by discussing the mutually beneficial trade relations between the two nations, agreeing with Mirza’s initial point on the importance of the relationship after the UK leaves the European Union next March. “Across government, we are acutely aware of both the challenges and opportunities that our relationships will have – in India, we are very well placed. He also referred to a high impact trade delegation to India by FAB last November, in which the organisation organised a five-day programme across Bangalore, Goa, Delhi and Chandigarh. The visit aimed to provide a series of “structured engagements” for British universities, manufacturers, professional services bodies and various other major sectors to help explore and better understand opportunities in India. The report confirmed that because of the Indian mission, FAB has been subsequently asked to host 11 technology leaders from Indian-based technology companies across key cities within the Northern Powerhouse, such as Leeds and Sheffield. It also celebrated the Northern Powerhouse Women in Fintech mission, due to occur between April 23 and May 2, which is expected to “provide insights and connections for female entrepreneurs” operating across north England and India. figures stating India is the fourth largest investor in the UK with approximately 800 Indian companies operating in the UK. It also confirmed the UK is the third largest source of investment into India.